Hatoful Boyfriend puts the player in the shoes of a reasonably well-adjusted high-school sophomore girl. She attends class, studies hard, participates in extra-curricular activities, and works part-time in a café during the summer. She just happens to be the only girl, and only human, at St. Pigeonation's, the country's premier school for birds. Literal birds, the feathered, beaked, using-statues-for-toilets kind. I approached Hatoful Boyfriend in a state of calm detachment. "This is a visual novel," I told myself, "a trope-filled dating sim." I'm not an eternal fan of the genre, but I have at least a passing familiarity and casual acquaintance with it. My character's days, worries, and environment all seemed par for the course, and I clicked along merrily, letting my mind slip back into the days of being 15 and worrying about boys. Only, somewhere along the way, the birds started to get to me. I think it was with the school doctor. A creepy and worrying character in his own right (by design), he became all the more troubling to me once I was forced to admit to myself that I've always found most birds kind of creepy. Perhaps I was exposed to too much Hitchcock over the course of my life, or maybe the clouds of pigeons in the city from my earliest childhood drove me away. Either way, I have never particularly been interested in touching birds nor in having them touch me. With that in mind, having to decide who I liked most among my childhood best friend (a pigeon), the quiet bookworm (a mourning dove), or the school's most popular jock (a fan-tailed pigeon) took on a whole new layer of discomfort. The species-swap highlights many absurdities of the genre. Flirting with somehow fully-verbal pigeons and doves, while constantly being reminded of your player character's human status, is silly. It's a delightful kind of silliness: the game revels in it. Everyone involved knows that the idea is patently absurd. And yet, despite the awkward language of "somebirdie," "anybirdie," and tail feathers, Hatoful Boyfriend cuts straight to the true human element of its story. Dr. Shuu isn't creepy because he's a partridge. He's creepy because of his inappropriate and homicidal comments toward a student in his care. Likewise, the mere idea of attempting to pursue the teacher or the café owner never sat well with me, not because of their beaks but because of their outsize power and influence in the young heroine's world. 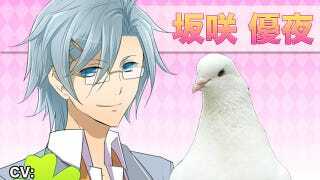 Hatoful Boyfriend is, in the terms of TV Tropes, a most affectionate parody. Where it mocks the genre from which it sprang, it does so in a way that comes across very much more "laughing with" than "laughing at." And yet for all that it may not have been designed to elicit a deep or thoughtful response, I walked away with one nonetheless. The presence of birds made the entire exercise absurd, but the absence of human faces made it imaginative. Without easy visual markers for attraction, the player has to think more about the personalities and desires of the characters she meets along the way, to choose among them. There is no saying, "Well, I know he's kind of evil, but he's so cute..." when the frame of reference has flown out of the window. A visual novel about birds in high school is no doubt a niche title, for a tiny niche indeed. (Particularly as even in the English version, the command menus and most associated text are still in Japanese.) Still, there's something kind of wonderful about spending a few hours playing a game that doesn't demand you take it seriously. It becomes a refreshing breath of surreal air (despite the pigeons) between the military engagements and demands to save the world and/or universe that form so much of the gaming experience. For terrible puns and humor commentary (which, in all honesty, enhance the experience), see our previous post on the game.